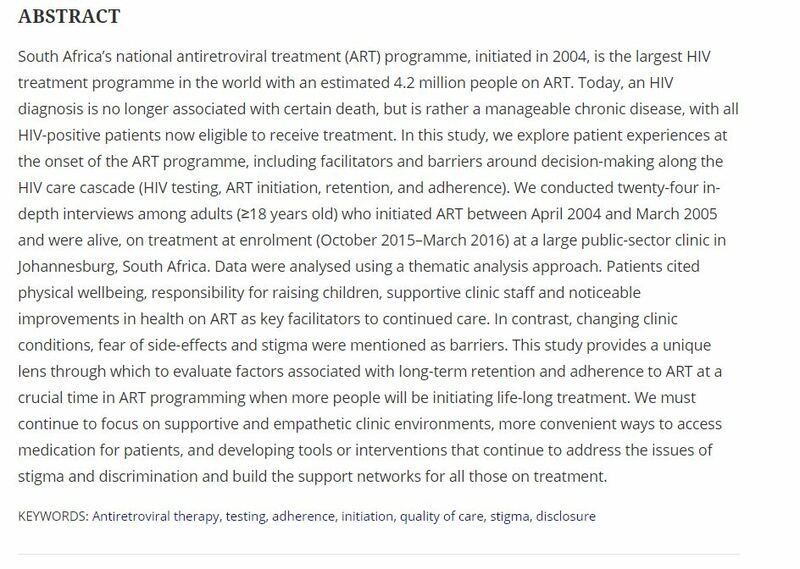 South Africa’s national antiretroviral treatment (ART) programme, initiated in 2004, is the largest HIV treatment programme in the world with an estimated 4.2 million people on ART. Today, an HIV diagnosis is no longer associated with certain death, but is rather a manageable chronic disease, with all HIV-positive patients now eligible to receive treatment. In this study, we explore patient experiences at the onset of the ART programme, including facilitators and barriers around decision-making along the HIV care cascade (HIV testing, ART initiation, retention, and adherence).